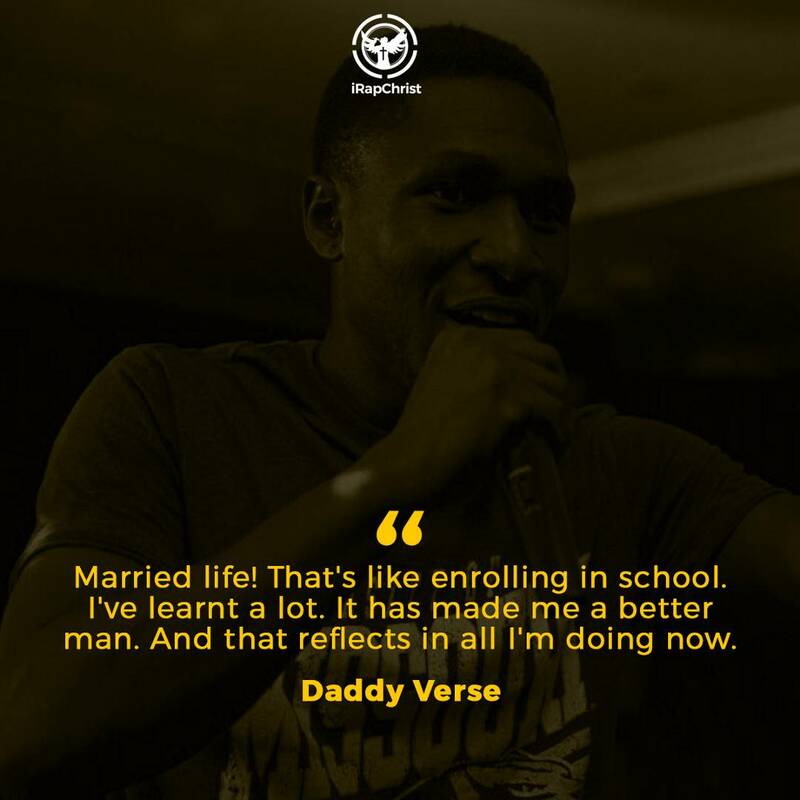 On the wake of releasing his debut project, The Break Out Mixtape, Rapper Daddy Verse (formerly known as A-Verse) which received generally positive comments, we decided to have a chat with him. In a tete-a-tete with our correspondent, he revealed that he has been married for a while now with two great kids. We are sure some fans could probably tell from the ending credits on the ‘Omo Jesu’ track. This interview touches on several topics including the obvious name change, Daboomsha’s SMH and Oluwatomi’s EOD. This interview is also a reintroduction of Daddy Verse. Read the full interview (via a Whatsapp Chat) below. A Verse: My full name will take a whole page to type, you know how the Yorubas give names, but let me give you the official ones. Okesola Samson Ayo. My bank recognizes that one. Owolabi Oluseyi: So Ayo is the A in A-Verse. Owolabi Oluseyi: Are you from Ilaro, Ogun State? A Verse: Ilaro, No… Ogun State, Yes. Owolabi Oluseyi: That was a close shave ? Where in Ogun state are you from? Owolabi Oluseyi: For a while now you’ve been going by A-Verse. Why the name change? Especially to Daddy Verse. A Verse: I knew that was coming. Anyways, a couple reasons brought about that change, but I’ll just let you in on this one: You know, a lot has changed about my music in recent years, from a battle rapper to an indigenous recording/ performing artiste (hope I constructed that correctly), its only imperative that my name changes to suit my new brand and audience. Plus, I’ve a couple friends call me that already, so when it was time to change the name, I decided to flow with it. You know like Saul changed to Paul kinda thing. Owolabi Oluseyi: I’m just curious to know the intent behind ‘Breaking Out’ and what it means to you as a rapper since this is like your first mixtape, if I’m correct? A Verse: First mixtape yeah. The breaking out was the original name for the project because it was supposed to be my entry project to the CHH industry but you know it’s the Lord’s counsel that will hold. The breaking out is the story of a struggling entity coming out of whatever has had him locked for long and that’s sort of similar to my story. Notice it is in continuous form. It is kind of like a process. The mixtape is just the inception. Owolabi Oluseyi: Nice, how has the reception to the mixtape been so far? I still can’t believe that people chatted me from outside the country to share their testimonies after listening. That’s something to be grateful for. Owolabi Oluseyi: So in one of the tracks you gave a shout out to a lady and a boy that sounds like family. Are you married? Owolabi Oluseyi: Tinu. That was the name of the lady. A Verse: Yeah! That’s the name of the best woman in the world. Owolabi Oluseyi: How long have you been married? Owolabi Oluseyi: That’s been a while. How has the married life been? how has it affected your career as a rap artist. Do you do rap full time? A Verse: Married life! That’s like enrolling in school. I’ve learnt a lot. It has made me a better man. And that reflects in all I’m doing now. As for career; to be honest, it’s complicated. My wife has been supportive since day one. As a matter of fact she reminded me of this interview. But you know sometimes, I cut in family time to do some things that I’d have to apologise afterwards. Sometimes, you try to get your head together and you hear you baby crying, you gotta drop that and babysit for a while. But it’s all fun tho. Apart from Rap, I’m a graphics designer and a print consultant/ broker. Not to forget, my family helps me to rehearse. I sometimes ask my son to throw words randomly at me and let me rhyme with them and we all enjoy it. Owolabi Oluseyi: So how long have been into rap? A Verse: Been into rap since late 90’s but I started writing my own songs early 2000. Sorry, I’m not to good with dates. I guess that’s been more than a decade. Owolabi Oluseyi: How long have you been rapping seriously or professionally? A Verse: I can’t remember at what point I made that decision but I know I’ve wanted to do rap professionally as long as I have been listening to rap. Even before I started writing songs. Owolabi Oluseyi: Okay. What do you think about the state of Christian Hip Hop (CHH) in Nigeria at the moment? I just hope that we will go all out in the full strength of God in us to make our calling sure, that those we seem to be reaching out to will see our light and come to it. Owolabi Oluseyi: I understand. What do you think about Boomsha’s SMH and Oluwatomi’s EOD? A Verse: OK let me just put it this way. Great songs from great MCs. They obviously pointed out some disturbing issues as regards the culture and the church, which takes a lot of boldness to do. I salute their courage. But for my take on it, I reserve it for now. I might publish an article to the effect soon. I hope you’ll host on your platform. Owolabi Oluseyi: We’ll definitely be glad to do so. It took a while between ‘Trouble’ the video and the mixtape. Why did it take that long and what happened during that period? A Verse: Anyway, the reason for hiatus is that I’ve been working a lot on my sound and style. Just like told you before that a lot has changed bout my music in recent time. I’m almost done with my EP that’ll will be dropping later this year. The mixtape is just the beginning of Odyssey of great music. Sit back and keep your legs crossed. So, you see I’ve been working all the while. Owolabi Oluseyi: Good to know. We’ll definitely be expecting the EP. Has anyone ever told you sound a bit like Kanye West? Especially on the ‘Break Out’ track. A Verse: A couple times yeah. Maybe ‘because he had a huge influence on my music. At some point I was gonna drop outta college too and make another college dropout album. Funny right? A Verse: Thank God I didn’t. A Verse: But I grew out of his influence and thank God I have a better purpose and sound now. Owolabi Oluseyi: I’ve heard of a couple of artistes who actually dropped out cause of Kanye. A Verse: That’s the power of music bro. We can use it positively too, to lead men to Christ and encourage morals in our community. God help us. A Verse: Same here bro. I feel like going on and on.